Get it on vinyl! Released on LP by Manhattan Records. Speaking about her 2009 album, The List, Rosanne Cash recently told Terry Gross: "When I was 18 years old, I went on the road with my dad after I graduated from high school. And we were riding on the tour bus one day, kind of rolling through the South, and he mentioned a song. We started talking about songs, and he mentioned one, and I said I don't know that one. And he mentioned another. I said, 'I don't know that one either, Dad,' and he became very alarmed that I didn't know what he considered my own musical genealogy. So he spent the rest of the afternoon making a list for me, and at the end of the day, he said, 'This is your education.' And across the top of the page, he wrote '100 Essential Country Songs.'" 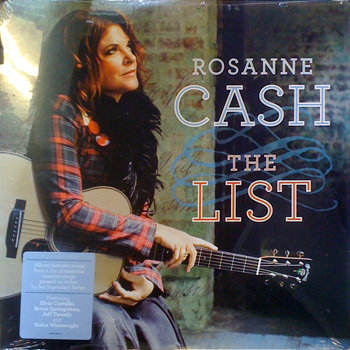 Rosanne selected 12 songs from Johnny's list for this special record, with guests including Bruce Springsteen ("Sea of Heartbreak"), Elvis Costello ("Heartaches By the Number"), Jeff Tweedy ("Long Black Veil"), and Rufus Wainwright ("Silver Wings").